African Kuba Stencil by Kim Myles and Cutting Edge Stencils! The artistry of geometric Kuba designs have been popping up in the most unexpected places lately. From chic salons in Paris to designer handbags, these bold tribal patterns are balanced, fluid and full of surprises. Our African Kuba wall stencil will add a dramatic flair to any interior decor. Use this wall stencil on an accent or feature wall, or even in the entire room. Anybody can achieve fantastic results without the hassle or cost of wallpaper! This African Kuba wall stencil comes with a free top stencil for filling in those tricky areas at the ceiling. 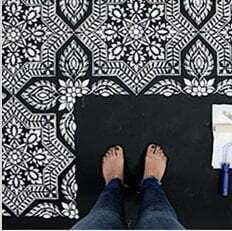 DIY decorators can also use this stencil for rugs or to stencil floors or to create one-of-a-kind designer curtains.